Written by Jose Quinonez on December 7, 2015 . Eight years into our mission to build a fair financial marketplace for hardworking families, we at MAF know that Lending Circles are empowering participants to build credit, reduce debt, and increase savings. But how do those gains translate into greater financial security? Do they produce meaningful improvement in our clients’ larger financial lives? As Lending Circles have flourished and expanded over the years, we’ve amassed data allowing us to better understand the program’s impact on clients’ overall economic stability and mobility. But as we began to dive more deeply into these questions, we realized that we lacked a clear definition of financial security and, by extension, a reliable way to measure it. Typically, income or credit scores are seen as proxies for a person’s financial well-being. But these common metrics aren’t adequate for assessing a person’s full financial life. Knowing someone’s income alone does not say much about her expenses, debts or net worth — especially in cases where income is volatile, uncertain from day to day or week to week. And while credit scores predict the probability that a borrower will repay a debt, they tell us little about a borrower’s true ability to repay. What will it take for a borrower to pay back that loan? Will she need a second loan to pay off the first? If so, can we honestly say she is able to repay that initial loan? And what about the myriad informal financial transactions our clients rely on to meet their financial obligations? Where do those fit in when assessing an individual’s financial security? For answers we turned to Abraham Maslow, the revered American psychologist who developed the “Hierarchy of Needs,” a model that outlines the physical, social, and psychological requirements that must be satisfied for an individual to realize her true potential. In his seminal work from 1943, Maslow organized human needs into five levels, ordered from the most basic (health and well-being) to the most complex (self-actualization), with each level facilitating the satisfaction of the subsequent, higher-order need. 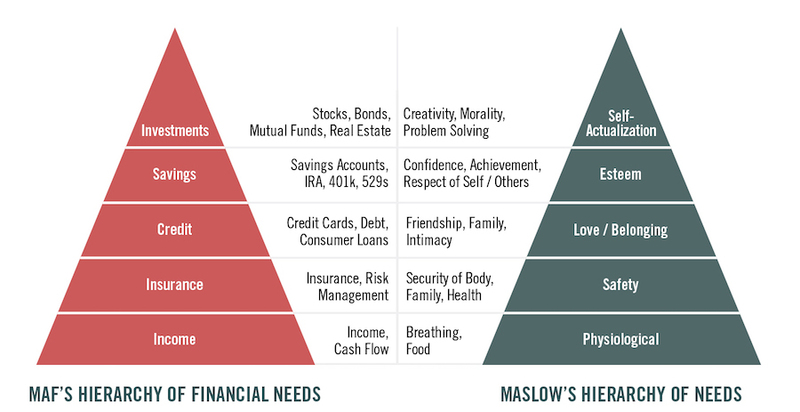 Using the same logic, MAF developed the “Hierarchy of Financial Needs” (HFN) to explain what individuals require to realize their true economic potential. INCOME: The most basic financial need is income to cover basic living expenses, such as food, housing, and utilities. Income can take many forms, from wages and dividends to government benefits or even transfers from family or friends. Income is the foundation of financial security. INSURANCE: To protect earnings, people must insure against unforeseen events that create setbacks. This requires taking stock of assets, including cash, belongings, and health, and securing against loss, theft, damage, and illness. CREDIT: To acquire assets such as a car, home, or education otherwise unattainable through income alone, people need credit. This requires individuals to have credit histories and credit scores to access, and leverage, low-cost capital. SAVINGS: When individuals save, they put away resources for specific goals. The ability to save demonstrates discipline and engenders confidence, a sense of achievement, and respect for oneself and others. INVESTMENTS: The pinnacle of the HFN is when people realize the dynamism of their economic potential. This is the stage where people can invest in ventures that carry risk as well as the potential for return. It represents a turning point because people have investments to generate income, rather than relying solely on earned wages. Through investing, people have the opportunity to attain important life goals such as achieving financial security for their families, retirement, and dignity in old age. The Hierarchy of Financial Needs is a revolutionary yet simple model that provides clarity regarding what people need to do to realize their true economic potential. For most Americans, financial security starts with a job. People need income to pay for expenses and balance their budgets. They also need to insure against shocks; they need to leverage credit to acquire assets; they need to save for a rainy day; and they need to invest for future returns. Although every individual faces a unique set of circumstances and challenges in managing these needs, the model is applicable across all income and demographic groups. In the same way that Maslow’s model applies to all people, we believe HFN applies to everyone as well, providing a clear 360-degree view of people’s financial lives. Despite the fact that 1 in 4 Americans is financially underserved, there has yet to be a comprehensive framework for understanding an individual’s economic needs. MAF’s Hierarchy of Financial Needs fills a gap in the economic development field, giving us a means of evaluating every person’s financial well-being. Consumers — especially low-income consumers — have complicated financial lives, often mixing and matching different financial products, informal practices, and government programs to achieve their unique version of economic security. Our holistic view of their financial well-being enables us to identify their strengths and challenges at every level. This comprehensive approach will equip the nonprofit sector, financial services industry, and policymakers to provide far more meaningful and effective solutions to improve people’s financial well-being.